Apple has announced the date for the event to be held for the release of the next iPhone version, i.e. the iPhone 5, whose actual name and specifications are still a suspense. 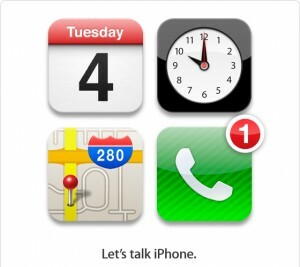 The date for the event named “Let’s Talk iPhone” is October 4th, 2011. The event would be held at Cupertino, at Apple’s headquarters. The event will begin at 10:00 am PT. There are many rumors, expectations and news about the new iPhone, which is expected to have a processor that the iPad 2 currently has, and the various internal and external specs would be surely upgraded to a higher level, to compete with the large Android devices by HTC, Samsung etc. rocking the market right now. Something more about the new iPhone that we heard, is an 8-Megapixel camera, the larger screen size and a good front camera. The retina display is already one of the best screens a smartphone can have, apart from the Samsung’s Super-AMOLED plus display. Nothing else was mentioned in the invite, except the date, time and the name of the event.